The following article was published in the Spring 2016 issue of iPhone Life magazine. Learn how to get the most from your iPhone by clicking here to subscribe. It took Apple releasing the Apple Watch to pique my interest in fitness tracking. I had friends who counted steps religiously, but it wasn’t until I saw the gleaming surface of the Apple Watch during Tim Cook’s reveal of the wearable that I felt compelled to follow suit. I soon learned that the process of fitness tracking was a sport in its own right. I had never tracked calories before, I didn’t know what my resting or peak heart rate was, and I was blissfully unaware of the fact that I was living a sedentary lifestyle despite working out semi-regularly. As it turned out, all of those long hours I spent working at the computer couldn’t be washed away by an afternoon yoga class. While using my new Apple Watch was like getting a crash course in the basic metrics of fitness, I still felt like I was poking around in the dark. I was gathering stats, but they lacked context. I could see my heart rate, but my watch wasn’t able to tell me things like how my heart rate was responding to the same workload over time or how many steps I should be taking in order to achieve a certain weight-loss goal. I became curious about whether other trackers had the same limitations and decided to see how the Apple Watch stacked up to the competition. I set out on a mission to find the best fitness and sleep trackers, settling on the Apple Watch, Fitbit Surge, and Polar A300. In the month following, I shamelessly sported a string of gadgets strapped to my wrist. Despite constant questioning from strangers and hazing from coworkers, I stayed true to my mission. But as I learned more about fitness tracking, bigger questions began to emerge. While there was clearly a booming market for fitness bands—with revenue from trackers projected to exceed $5 billion in the next three years—there were also signs of trouble. A 2015 study from Argus Insights shows that 60 percent of Fitbits (the best-selling fitness band) end up in a drawer within a year. I wanted to know what exactly was happening here. Did we see a future in which fitness trackers could help us live healthier lives, or did they lack staying power? In pursuit of the answers, I spoke with a CrossFit trainer, a professor of kinesiology, and a biometrics researcher to gain their insights on the matter. Why Track Fitness in the First Place? My enthusiasm began to wane after a week of wearing all three trackers, and I started to wonder: If I knew I was working out regularly, did I really need a fitness tracker to tell me that? Chris Eschbach, director of the biometrics lab for Valencell, which develops sensor technology similar to that present in the Apple Watch and Fitbit, pointed out the flaw in my logic. I had been called out. And after talking to CrossFit coach and Boom Fitness owner Tihomir Liptak, I soon learned that trackers not only keep your overly optimistic memory in check, but also give you metrics that allow you to set concrete goals. “If you say, ‘I want to lose weight,’ nothing is going to happen,” he said. “In CrossFit, you want to be able to come up with concrete measurements of where you are and how you’re improving. The satisfaction of meeting goals is a very big thing for people—it helps them to continue." Liptak says there are three main ingredients that reap results at the gym: goal setting, measuring progress, and community support. He says fitness trackers aim to simulate what he provides for his gym members, with an added bonus—the accessories stay with you even when you’ve left the gym. You’ve probably seen the headlines in the past year telling you that “sitting is the new smoking.” That’s because a 2015 report by the Annals of Internal Medicine shows that if you sit for extended periods of time, you’re more likely to develop diseases such as diabetes, cancer, and heart disease. Most fitness trackers and smartwatches on the market track your steps as well as your heart rate in order to calculate how many calories you’re burning for everything from running to cycling to CrossFit workouts. Measuring heart rate not only gives you a more complete picture of your activity, but it is also a helpful self-assessment tool, because it tells you how fit your heart is, and shows you how hard you’re pushing yourself. The U.S. Department of Health assigns you a maximum heart rate zone of 150–200 beats per minute depending on your age. Based on these guidelines, the Fitbit Surge and Polar A300 tell you how hard you’re working during an exercise session, helping you to decide whether to push harder or to scale back. 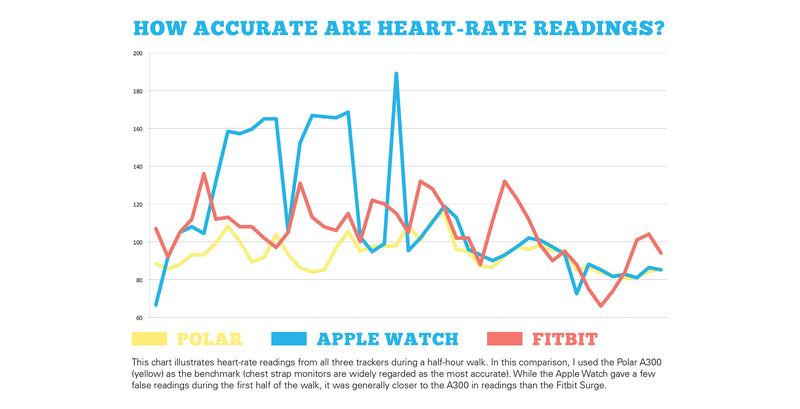 The Apple Watch doesn’t have this feature, however, leaving it up to users to learn their own target heart rate. I had begun to see a compelling argument for fitness tracking, yet I also wanted to learn why people were abandoning their devices, even though they're some of the best fitness and sleep trackers on the market. According to Tudor-Locke, that statistic might be misleading. “I never intended for people to wear these [pedometers] for the rest of their lives,” she said. “They are a useful tool to teach you what it means to be active.” Tudor-Locke said she often recommends people wear their trackers seasonally to prevent sliding back into old habits. Whatever the reason, I had slipped into a state of complacency when it came to monitoring my activity. I was more active than I had been before the experiment, yet I had stopped using my Fitbit and Polar trackers. While they each had some great features, I found them to be too bulky and to require too much effort to use. I still wore the Apple Watch, however, but I only used its most basic fitness features, such as its stand reminders. Polar A300 is the best choice if you’re looking for hands down the most accurate heart rate readings and don’t mind less reliable step counting capabilities. It is not the best choice if convenience and style are important to you. 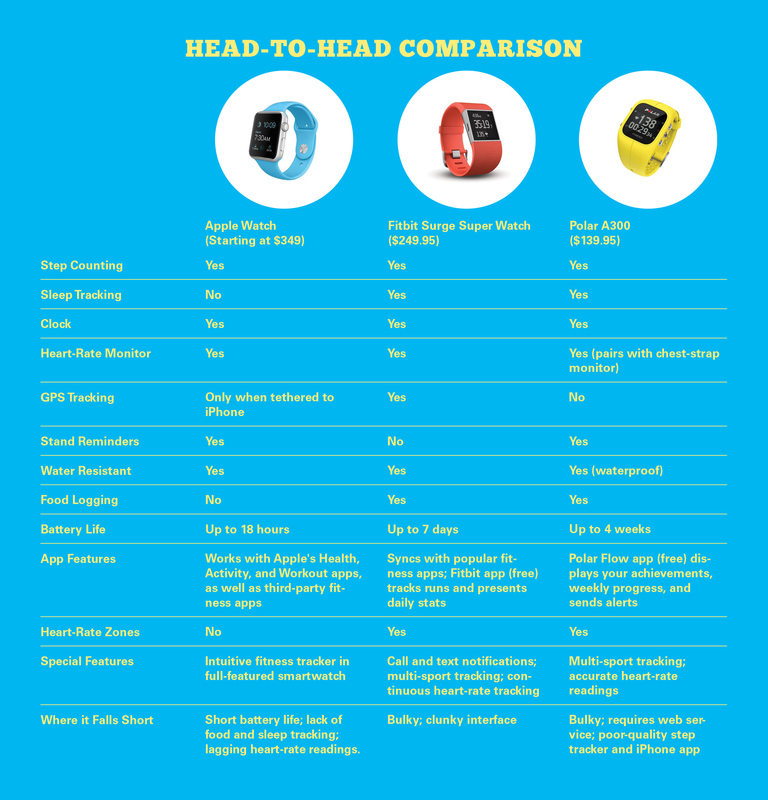 The Fitbit Surge is a good option for distance-based exercise such as running, walking, and climbing. It’s easy to track your route and pace with GPS, and the step counts are accurate. Heart rate tracking is not its strength, however, and it is too bulky to wear all day and night, even though that’s what it’s designed for. The Apple Watch is all around the best fitness tracker. It accurately measures heart rate (minus a few false readings) and steps, and its large set of non-fitness related features help keep you wearing it. Eschbach has an inspiring vision for the future of fitness tracking. He said that eventually we can quantify things like stress using metrics he’s begun studying, including heart rate variability and breathing. Our trackers would take that information and provide insights, such as reporting lowered stress levels after a yoga class or a 1 percent improvement in cardiovascular fitness after a week of regular exercise. But we're not there yet, and I didn’t come out of this experiment as a fitness tracker convert. I did, however, learn what it means to be active. I learned that our brains have a way of either exaggerating or minimizing events depending upon our moods. For those dedicated to the cause, today’s fitness trackers have what it takes to help you set goals and make progress toward them. But for those of you, like me, who want a fitness tracker that does the work of goal setting and data analysis for you, I’d suggest waiting a couple of years until Eschbach’s dream device comes to fruition.